Still struggling to put points on the board, Estill’s girls saw their record fall to 4-9 with recent losses to two of the better teams in the 14th Region. 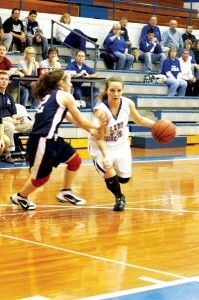 Perry County Central scored a victory and Knott County Central won 59-38. Estill has now scored under 40 points in four of 13 outings. Coach Mark McKinley’s squad travels over to Powell County on Thursday.